"The building of this House was begun by Sir Godfrey Kneller, Bart., A.D. 1709." The residence erected for the country retreat of the celebrated painter did not possess any architectural character worthy of note, either externally or internally, being merely a plain square brick dwelling-house, two stories in height, with red brick arches over the external openings. The walls and timbers were found to be in a very dilapidated condition, and the house was consequently taken down. The space formerly occupied by the old house, at the groundfloor level, is now covered by the principal's residence, the school library, and the three adjoining class-rooms, &c.
* Some of the columns of the drawing-room will be found in the principal lecture-room of the new building. 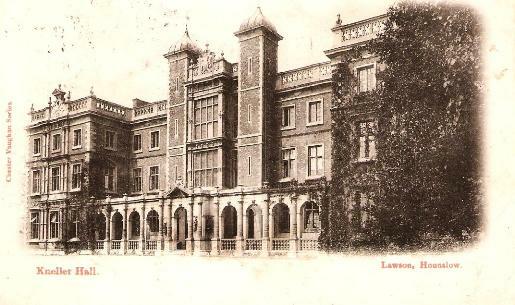 Kneller Hall School, as now arranged, affords accommodation for about 100 pupils, with apartments for three masters, and a separate residence for the principal master. The interior accommodation is carried out without decoration, but particular care seems to have been taken to render the whole of the arrangements as complete as possible, both as regards economy of labour and expense in execution. A steam-engine of 3-horse power is provided for pumping the water to supply the several tanks and cisterns required for the establishment; and steam power is applied to work the machinery for washing, and in the laundry department, also, for cooking, and heating water for the baths, &c. The mangle is turned by steam. There is a drying-closet over the boiler. The building is lighted by gas, supplied through a main laid down from Twickenham hy the Brentford Gas-light Company. The ground-floor and staircases are warmed by Mr. Perkin's apparatus, the furnaces being placed in the basement, which is vaulted throughout the central portion of the building. The ventilation introduced in the school department is in accordance with the system adopted by the Committee of Council on Education. Fire-mains have been provided both within and around the building. The class-rooms, U on plan, are fitted up with desks on raised platforms. The chapel is placed over the school library, V, and occupies the entire remaining height of the building : this is not yet finished. The rooms adjoining it and above the ground-floor are appropriated to apartments for the masters and as dormitories for the pupils, dwarf partitions, 6 feet 6 inches high, being fixed in each room, so as to form a dormitory of about 7 feet by 12 feet for each pupil. Lavatories are provided in each room. The type which the architect has studied for the principal facades of the building is "Wollaton Hall," with other examples of the architecture of that period, and the effect of the front is very satisfactory. The cornices, parapets, quoins, dressings to the windows, and other enrichments (excepting a small portion of the arcade, which is worked in cement!) are executed in Bath stone. The plinth round the building is of Portland stone; the external walls are faced with red bricks, the numerous firs, cedars, and rich foliage of the evergreen shrubs which ornament the grounds, inducing the selection of such materials. At a short distance from the building a broad stream of water passes through the grounds, and adds much to their beauty. The original contract was £17,336, exclusive of the fittings, but of the total ultimate cost we are not informed. 2893. (Chairman.) Will you be good enough to state to us the origin and history of the institution of Kneller Hall as affecting this question? 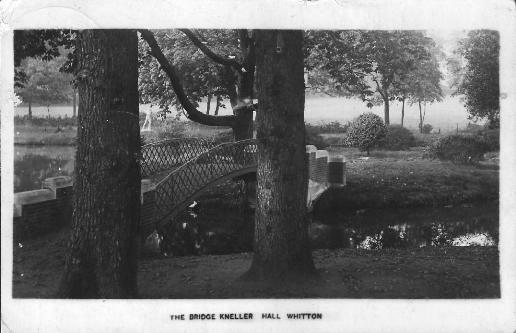 "Kneller Hall was intended to prepare schoolmasters for district pauper schools, and it was believed at the time when it was first set agoing, that the establishment of such district pauper schools was quite certain and very soon to follow ; but it was found that there were greater difficulties in the way than were anticipated; the Committee of Council had no power of interfering to compel the erection of district pauper schools, and the Boards of Guardians resisted it simply by doing nothing, and the result was, that very few such schools were erected. 2894. (Mr. Senior.) Six, I believe? - Six, I think altogether, or seven, and Kneller Hall became purposeless. 22895. (Chairman.) You are aware, of course, that Kneller Hall has always been pointed to as an example of the value of a Government school. Do you consider that to be a fair representation, or do you think that it only failed because it was in anticipation of a requirement, which requirement never came? - It certainly only failed in the latter sense: it was part of a scheme which was never carried out. 22896. How long was it in existence? 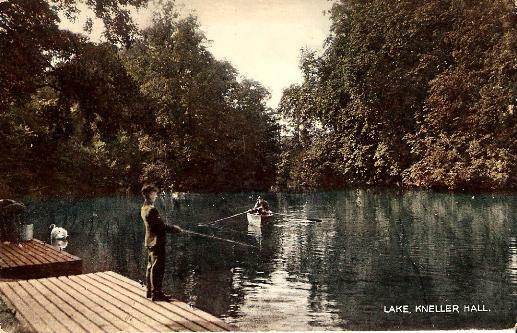 - It opened in 1850, and it closed at the end of 1855, so that it was just six years in existence. 22897. How many schoolmasters did it send out? - I cannot answer the question offhand. 22898. About how many? - I do not think that I can answer the question offhand, but that can be very easily procured. I made a complete return, which is in the possession of the office. 22899. As there were no pauper schools for which the institution was originally intended to be the training school, where did the masters go? - The majority went to the workhouse schools, where they were thrown away, and some went to schools in the Colonies, and some to schools in the prisons." 22900. Have you had any means of knowing how they have succeeded? 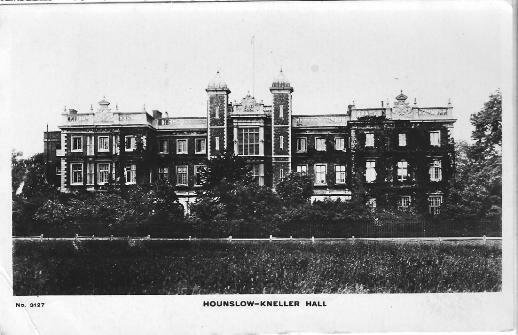 - Those who went to the schools in the Colonies have succeeded fairly well; those who went to district pauper schools, which of course were very few, succeeded extremely well, and the rest, those who went to the workhouse schools left them as soon as ever Kneller Hall was given up, and the compulsion which kept them there was withdrawn, and they have since been employed in National and other schools of that sort. 22901. (Sir J. Coleridge.) What compulsion was that? - It was a moral compulsion only, but they understood that it was part of their duty, and very few of them flinched from it. 22902. (Chairman.') Was there any difference in the training of the youths in that school from the system pursued at other training schools? - The industrial education was a little more formal; more regulated. 22903. But in other respects the training was the same as in any other training school? - Yes. 22904. (Mr. Miall.) Can you state the average expense of each of the young men trained there? - I cannot tell you; it was very high, becauso the school never reached its full numbers, for the obvious reason Rev. F. Temple, that there was no prospect for the young men after they had passed D.D. 22905. (Chairman.) Did it exceed 50l. a head? - Considerably. 27 Jan. 1860. 22906. (Sir J. Coleridge.) It is a very large place with large grounds?" "Yes; the mere keeping of it up cost a good deal of course. For the first year there were only ten students in it, so that it must have been very expensive. All the accounts were fully returned."